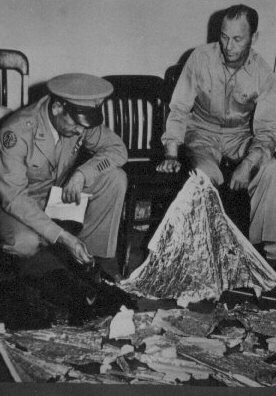 Brigadier General Roger Ramey (left) and Colonel Thomas J. Dubose (right) examine debris from the Roswell crash on July 8, 1947. Note the telegram in Ramey's hand and also notice he is wearing a full dress uniform during July in New Mexico with no air conditioning. The original photo was taken by J. Bond Johnson. Initial photographs taken of some of the Roswell debris have caused a bit of confusion about the whole incident. Various conflicting statements about these photos have bounced around like ping-pong balls. On the afternoon of Tuesday July 8, 1947, Bond Johnson, then a young reporter for the Fort-Worth Star Telegram, was told to go out to General Ramey' s office with his camera and take some pictures. When he got to the general' s office he saw the floor covered with debris of some kind. Johnson used a Speed-Graphic camera and took a total of eight photographs on the two-sided film plates. Johnson recalls that the debris was pretty plain looking and not very exotic. This leads many critics to claim that it could not possibly have come from a high tech, space-traveling vehicle. However, the Mars Rover and Lunar Lander are pretty ordinary looking also. If one of them crashed they would also look like a pile of ordinary junk. Bond Johnson later became Colonel Bond Johnson and served four tours of duty at the U.S. Pentagon. Johnson states clearly that the debris he photographed was not a weather balloon. He also remembers that the debris filled the room with a strong, burned smell. Everyone who entered Ramey' s office remembers the strong odor from the debris. Bond says the photos he took were of the real debris. If there was a switch for subsequent photos it occurred after he left. After fifty years Johnson got a bug under his saddle to go back and look at the original photographic plates. He had not seen the plates since that fateful day of July 8, 1947. Not only that, Johnson was the last civilian to ever see the Roswell crashed flying-saucer debris. So Johnson left his home in Southern California and went down to the University of Texas at Arlington where the original plates had been stored. With special permission, Johnson was able to examine the original plates and have photographic copies made from them. Inexplicably, one of the original plates was missing and no one knew where it was. When Johnson returned to California, he invited MUFON investigators Ron Regehr and Debbie Stock to examine the photos he had brought back. They made an amazing discovery that had been completely overlooked for fifty years. One of the photos clearly shows General Roger Ramey kneeling next to the debris with a piece of paper in his hand. Enlarging the photo allowed the three investigators to actually read parts of the telegram! Johnson, Regehr, and Stock hired six separate teams of experts to blow up and examine the telegram in Ramey' s hand. All six teams pretty much concluded the same thing. In an interview appearing in the November 24, 1991 edition of Florida Today, Thomas DuBose, now a retired general, stated that the material Ramey had photographed and displayed to the press later was a weather balloon and that he (DuBose) had already transferred the real debris to a lead-lined pouch which was sent to Washington D.C. Other sources quote Dubose as saying there was no switch. The material was not changed, only the story. J. 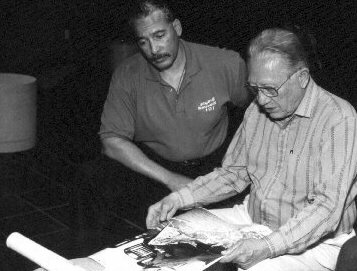 Bond Johnson, photographer of the Roswell crash debris shows author Harold Burt remarkable details later discovered in the original photos. Johnson was the last civilian to see the crash debris. 1. No one knew what the real debris was, but they knew it was from something we didn' t make. 2. They knew it was not a weather balloon. Both men were experts at identifying weather balloons and radar arrays; Bond had been a colonel and Dubose a general. 3. Major Jesse Marcel was in General Ramey' s office when the first photos were taken and he appears in several of them. 4. In the initial photographs General Ramey appears in full dress uniform, with hat. This was in July in the middle of the desert with no air conditioning! The reason for this was because Ramey knew this was debris from a real flying saucer and the picture of him with it would be seen throughout the world. 5. In a recent interview Walter Haut told author and UFO Encounters TV show host Bill Birnes that there was absolutely no question about the fact that the debris was from a flying saucer and not a weather balloon. Walter Haut also told me the same thing when I interviewed him in person at Roswell in 1998.